So I went to a few meetings, exchanged a few emails, and convinced some of my department that we should partake in this creative and community building activity. 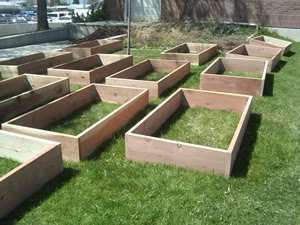 In mid-April some boxes appeared on the plot. The next day the facilities and ground crew took out rows of grass. Then we had to level the boxes. 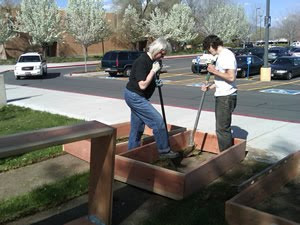 On Earth Day we had a gathering to mix dirt and place dirt in each of the boxes. Joy in the Garden chatted with Globe radio. Fun was had by all! The weather at the end of April and the beginning of May included snow and frost at night. 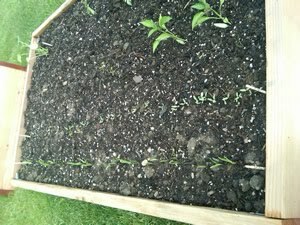 We finally planted our row of spinach and row of beets on May 7. 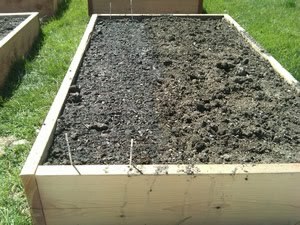 Two weeks later the two rows of plants have sprouted! And we added two tomato plants, two pepper plants, and a zucchini plant. More to come next week! We are farmers!